In a chilled mixing bowl, beat the cream until soft peaks begin to form. Add vanilla and beat until peaks are stiff. Scrape the unsweetened whipped cream into a different bowl and set it aside. Using same mixing bowl you used to whip cream (no need to rinse), beat together the cream cheese and the mascarpone. Stir in 4 tablespoons of the powdered sugar and the melted white chocolate. When smooth, fold in about 1 cup of the unsweetened whipped cream. Arrange 15 ladyfingers halves in bottom of an 8 inch square glass dish. Drizzle with half of the orange juice. Spread half of the white chocolate mixture over ladyfingers, then spread a layer of thinly sliced berries over the white chocolate mixture. 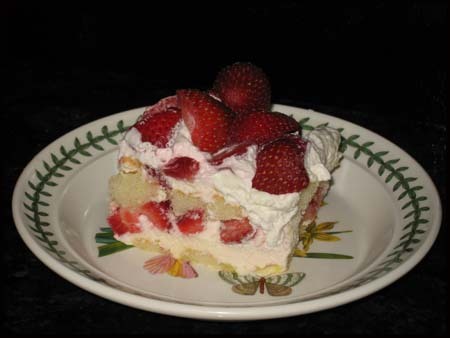 Arrange remaining ladyfinger halves over strawberries, then spread with a final layer of white chocolate mixture. Stir remaining 2 tablespoons of sugar into reserved whipped cream (you may use less sugar if you like). Spread over the white chocolate layer and chill for at least 3 hours or until ready to serve. When ready to serve, cut into squares and arrange remaining sliced strawberries over top. Note: To melt white chocolate in microwave, place in a microwave bowl and microwave on 50% power for 1 minute. Stir and continue microwaving on 50% power until smooth. You may also melt chocolate in a bowl set over a pot of boiling water or in a double boiler.